Modern steel has rapidly become one of the most energy efficient building materials to produce. Between the early 1990s and 2007, the U.S steel industry cut energy use per ton of steel by nearly 1/3. 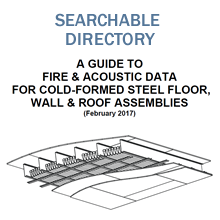 Cold-formed steel (CFS) buildings can be some of the highest performing buildings. CFS buildings have been built to Energy Star status, and can meet LEED requirements and other green building programs and standards. Whole building design of the energy package using readily available simulation tools will enable code compliant and cost-effective solutions to today's more stringent energy codes. With a few basics under your belt, you can build a steel framed building that is as or more efficient than a building constructed with competing materials. First, keep in mind that all building materials transmit heat. 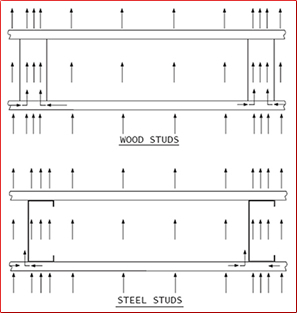 When placed in a wall or other part of a building, the wood or steel studs, joists, trusses, concrete beams, masonry block, brick, and even nails and screws provide a pathway for heat transmission. In some cases, the extra heat loss amounts to very little in terms of actual energy use. In other cases, especially in colder climates, it can be significant. In order to address unacceptable heat transmission though metal, wood, or concrete, designers and building codes frequently require a layer of continuous insulation, usually a foam product, on the exterior of wall, floor, or roof assemblies that are exposed to the exterior. For any building, foam insulation adds costs, for example, a 1” layer of foam on a steel wall assembly can add as much as $1/sf of wall area, or thousands of dollars to even a small building. Recognizing that the steel industry is innovative. Numerous systems have been developed that effectively eliminate or reduce thermal bridging through steel members. Systems include steel panels imbedded into foam insulation, “warm wall” designs where steel is placed entirely inside the insulation layer, and cost effective ways to use continuous foam insulation. Encouraging Steel Framing Alliance members to take advantage of some cost effective methods to build a higher performing building without necessarily adding excessive amounts of foam insulation to the exterior. Higher efficiency water heaters or heating and cooling equipment, better windows, or more insulation elsewhere are all options to explore. Encouraging steel framers and manufacturers to get involved early with the designer or building owner to insure a good performing building that does not needlessly over burden the framing with excessive costs for energy code compliance. The Steel Framing Alliance Thermal Design Guide describes how to use a building simulation or performance approach to getting the most out of your design. However, this requires a change in role of framers or steel manufacturers or suppliers on the constructed project.They must be willing to get much more involved in the upfront design of the building. 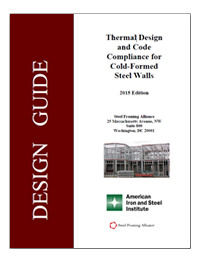 Thermal Design and Code Compliance for Cold-Formed Steel Walls. Improving Thermal Performance of Single Family Homes in Hawaii through High Solar Reflectance Coatings on Above Grade Walls. Also applicable to homes in other locations of Climate Zone 1 and 2 of the International Energy Conservation Code. Training Session. Understand the IECC and how it relates to steel framing. Although developed for Hawaii with a focus on housing, this session provides information applicable to all building types and locations throughout the United States. Siding attachment over foam insulation – research report. SFA, with support from the New York State Energy Research and Development Authority, sponsored this testing and analysis program to provide solutions for attaching siding and other cladding materials to CFS walls when the energy code requires thick layers of continuous insulation on the exterior of the wall. Assessment of commonly-used code compliance simulation software relative to cold-formed steel framing. Understanding software options will become more important to the CFS industry as newer energy codes are adopted in the coming years.